When Surface Pro 3 moved to a 3:2 aspect ratio, it made a lot of sense. 16:9 in a tablet makes for a very poor experience, and in a laptop, it is not much better. Almost everyone has moved to 16:9 in the laptop space and the lack of vertical height can make for a less than ideal experience. Most web content is vertical, and working in Office means you want vertical space as well. The widescreen does help with two windows snapped open at once, but I always find myself craving more vertical room. On a tablet, I feel that 16:9 is even worse. Holding a 16:9 device in one hand can feel very heavy due to the length of the tablet, and turning it to portrait means that it is very tall and skinny. The move to 3:2 really squares up the device, and makes it a lot more balanced in either direction. Holding it in one hand is much easier, and finally portrait mode is usable on the Surface. So the aspect ratio is a big improvement. The display size also has a slightly wider corner to corner of 10.8 inches versus 10.6 inch model that came before this. The actual width of the display is about 9 inches, compared to 9.2 on the outgoing Surface 2 model. The display height is now 6 inches, up from 5.2, so the total area of the display is almost 54 square inches, up from 48 inches on the outgoing model. To fill this display, we have a Panasonic panel with a resolution of 1920x1280. 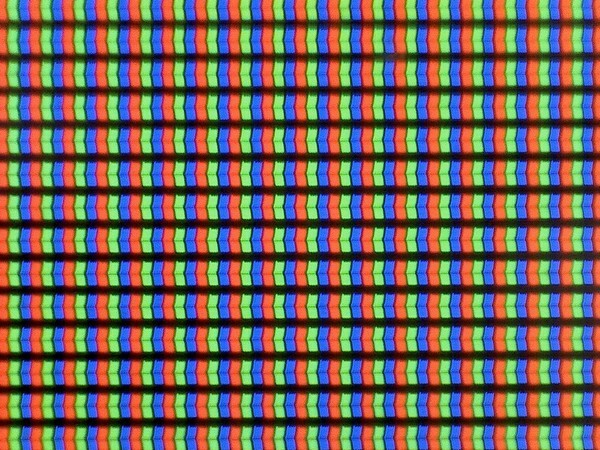 This is roughly the same pixel density as the Surface Pro 3’s slightly larger 12 inch 2160x1440 display, coming in at 217 pixels per inch. It is not the highest PPI of a tablet, but it makes a good compromise between desktop and tablet use. Speaking of desktop use, I found that it makes a perfectly acceptable size for a small notebook, and even with touch it was not too difficult to work with the icons. When Microsoft launched Surface 3, it said “with incredibly accurate colors and clarity from multiple viewing angles” and that would be excellent to see. The Surface Pro 3 has a decent display, but it was not the most accurate device we’ve tested. 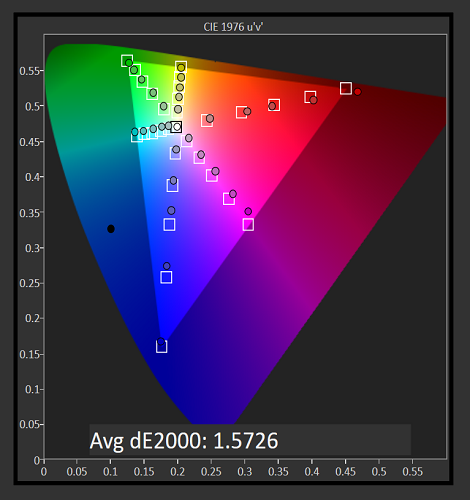 To do our display testing, we use SpectraCal’s CalMAN 5 suite with a custom workflow. 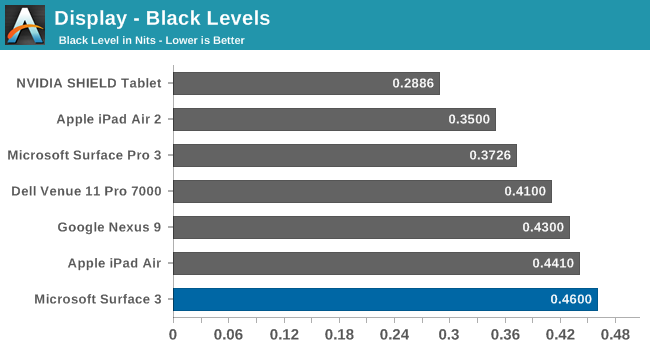 Brightness and contrast readings are taken with an X-Rite i1Display Pro colorimeter, and color accuracy is measured with an X-Rite i1Pro spectrophotometer. We target 200 nits brightness when doing our tests. 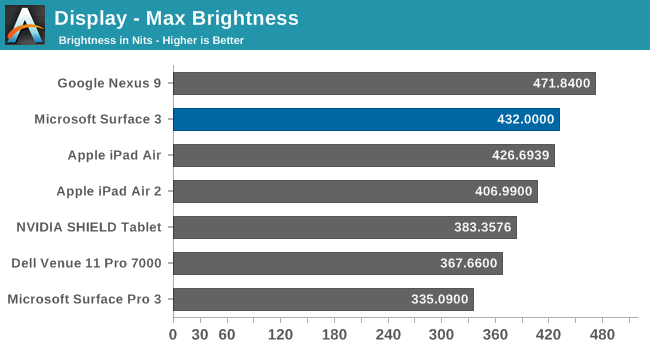 The Surface 3 gets quite bright, coming in at 432 nits at maximum output. 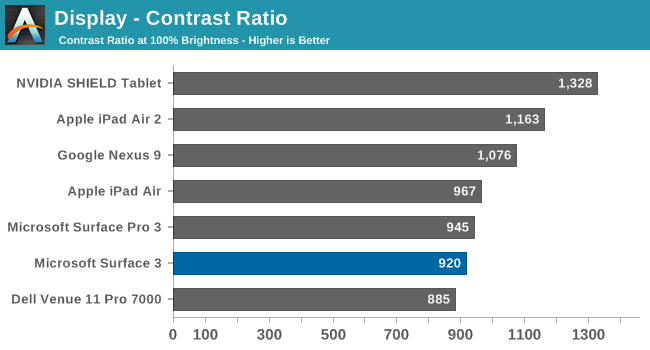 The black levels are a bit high, but overall contrast is a decent 920:1. 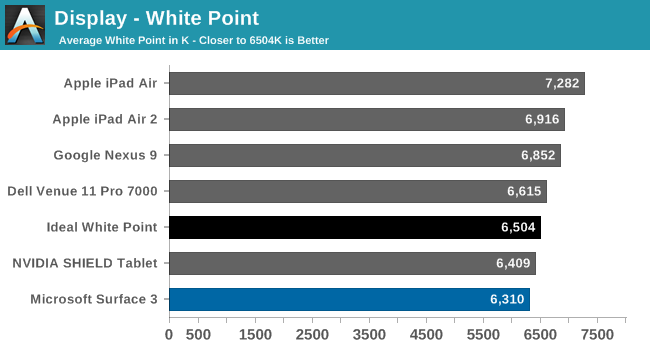 This makes the Surface 3 almost 100 nits higher than the Surface Pro 3 that Anand reviewed last year, which is a good start for this less expensive version. 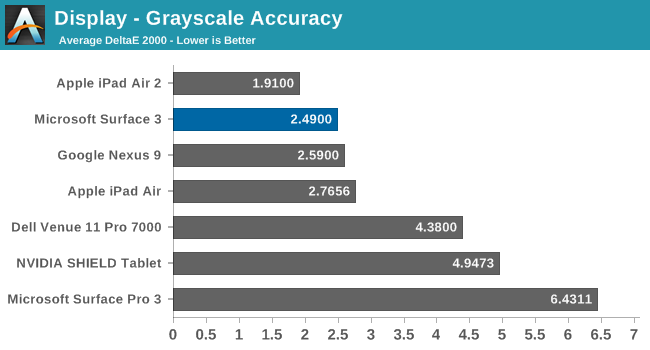 The grayscale average for the Surface 3 is very good, coming in just about at 2.5 as an average for the sweep. There is a bit of a spike at 25% but it is not indicative of the overall calibration. 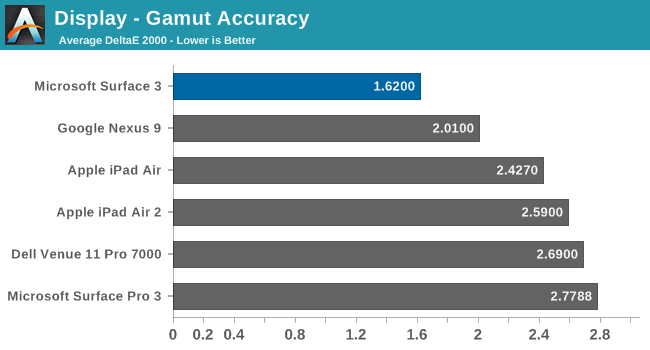 Gamma is a bit low, but the white point is fairly close to the ideal value. 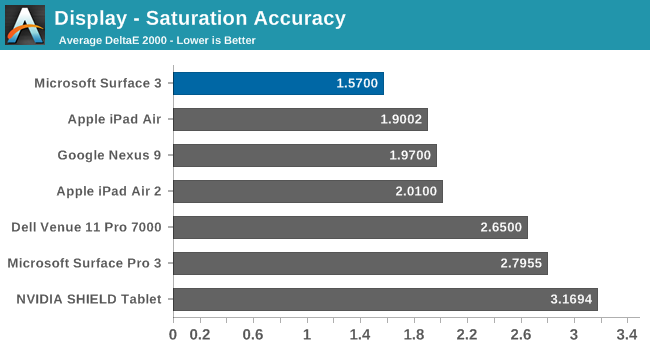 The accuracy on our saturation tests is outstanding, with an overall average score of just 1.57. 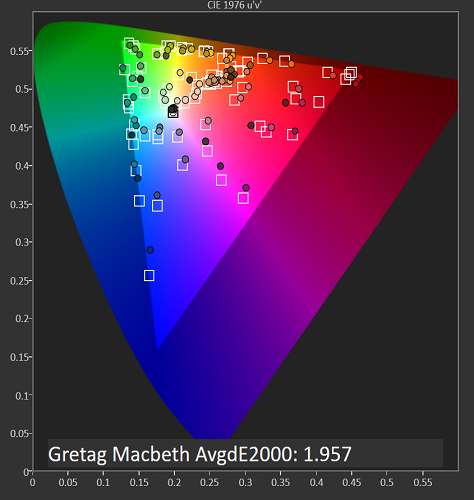 Looking at the individual colors, the red is a bit oversaturated at 100%, and blue tends to be undersaturated, but the amount of error is very small. 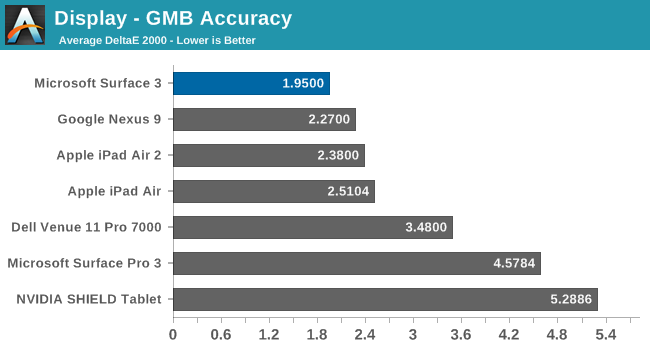 Once again the Surface 3 comes in with fantastic scores on these two tests, with the comprehensive GMB test under 2. 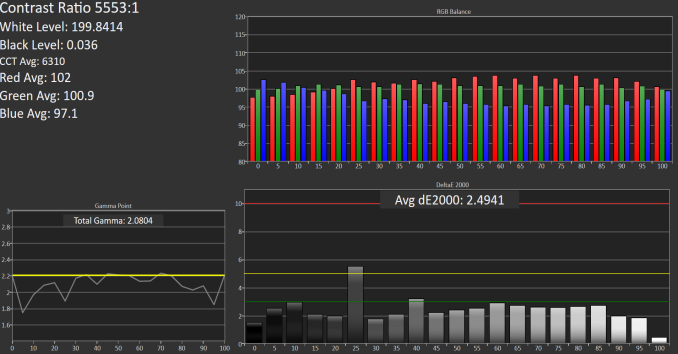 When we are doing these tests, values under 3 are considered good, and the Surface 3 has passed with amazing scores. The best part of this is that all of this is done without the use of an ICC profile, so that means the hardware is being calibrated directly. ICC profiles can fix some issues, but not all programs respect them so having it done in hardware is a much better option. Since this is a full x86 Windows operating system, we can also calibrate the display with the CalMAN software. Even though it was very good out of the box, the calibration pulls it even closer to perfection. Surface 3 has one of the most accurate displays we have ever tested, which is great to see in what is considered the value member of the Surface family. Microsoft promised an accurate display and they have delivered. My sentiments exactly. I feel there's a very small number of people who "need" a tablet/laptop all-in-one and are willing to sacrifice the best of either world, for an average tablet/mediocre laptop. I might be generous calling it an average tablet, just because of the lack of apps compared to android and Apple. If you're not going to hit at an attractive price point, then I'm not sure of your expectations.